Vin Santo is a traditional style of Italian dessert wine from Tuscany. Vin Santo is often made from white grape varieties, such as Trebbiano and Malvasia. The grapes are often dried on mats (or sometimes indoor racks) to concentrate the sweetness of the fruit. The small amount of juice that’s extracted is then aged in wood barrels called caratelli for at least three years. Vin Santo, which means “holy wine,” is believed to have gotten its name from its use and association with the Holy Communion. Vin Santo, which has a beautiful amber color, is often described as having nutty or raisin notes, with a honey, vanilla or cream finish. In Italy, it is traditional to serve the wine as a digestif at the end of the meal after espresso. 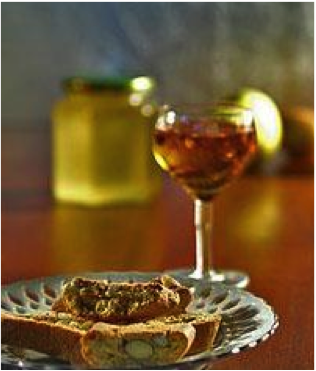 It is often served with almond biscotti that are dunked into the wine.